Cesair was the leader of the earliest inhabitants of Ireland, the people who settled in Ireland before even the time of the Biblical flood. Her exploits are recorded in the ancient manuscript 'Lebor Gabala Erenn', also known as the 'Book of Invasions' as it chronicled the arrival of the earliest peoples who inhabited Ireland. First were the people of Cesair, then the people of Partholon, the people of Nemed, the mysterious Fir Bolg, the supernatural Tuatha De Danann, and finally the Milesians who are the Gaels from which the modern people of Ireland are descended. Cesair (pronounced 'sesser'), was the granddaughter of Noah, who was refused entry onto the Ark by her grandfather and so decided to create three Arks of her own. When Cesair was but ten years old her foster father, a priest in Egypt, told her to gather together a group and set out in order to escape the flood that was to soon follow. She built a fleet of three ships which she populated with as many capable women as she could find, each possessing a different skill. When her own father Bith was refused entry onto the Ark, along with Fintan Mac Bochra and Ladra, Cesair offered to bring these three men to safety as long as they acknowledged her leadership. They set sail for Inis Fail (the land of destiny, Ireland), reasoning that as Ireland was as yet unpopulated by man that no sin could have ever been committed there, and so would be safe from the flood sent to cleanse the world of evil. 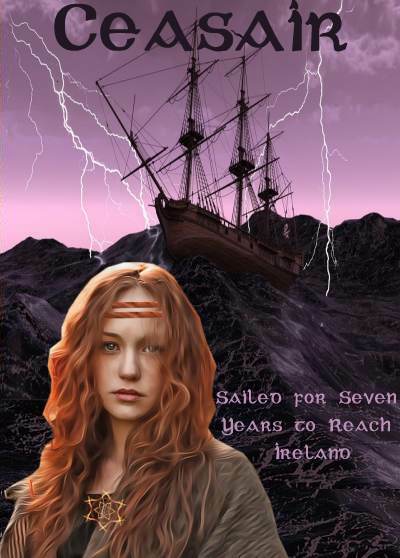 The journey was perilous and took seven years but finally the people of Cesair arrived in Ireland. It was the year 2361 BC according to 'The Annals of the Four Masters', but only one ship had survived the journey, this containing fifty women and three men. They decided to divide the women into three groups, each group to take one of the men to populate the land. They also divided up the sheep they had brought with them (the first sheep to come to Ireland). Cesair allocated herself to Fintan's group. Banba, a great warrior woman, was the leader of Ladra's group. Now this was a huge responsibility for the three male warriors who remained with these women. And for Bith it was too much and he soon succumbed to illness, having been overwhelmed by the responsibility of impregnating sixteen women. He became the first man to be buried in Ireland. Cesair and Alba divided his women and brought them into their own groups. Ladra, incapable of surviving the now increased greater demands, also died, which left Fintan as the only man on an island of fifty women! Feeling inadequate in the face of this mammoth task, his reaction was perhaps unsurprising: Fintan fled. He hid out in a mountain cave and when the flood struck he took the form of a salmon fish, and then a hawk, surviving for over five thousand years. Cesair was broken-hearted at having been abandoned by her great love and died shortly afterwards. As for the remaining women they were all washed away in the flood, all apart from Banba. It is remembered that Banba and Fintan, the only two to survive, later gave existence to the mysterious and supernatural Formorians. Cesair was the first inhabitant of Ireland, a fantastic leader able to exert her authority and power over all who followed here. She was unwilling to wait patiently while a wrathful God planned her extermination! She is thought to have been the earliest Irish Goddess, displaying power and sexuality, common traits in Irish Goddesses that were to follow her.